Home Brain & Behavior What are emotion expressions for? That cartoon scary face – wide eyes, ready to run – may have helped our primate ancestors survive in a dangerous wild, according to the authors of an article published in Current Directions in Psychological Science, a journal of the Association for Psychological Science. The authors present a way that fear and other facial expressions might have evolved and then come to signal a person’s feelings to the people around him. 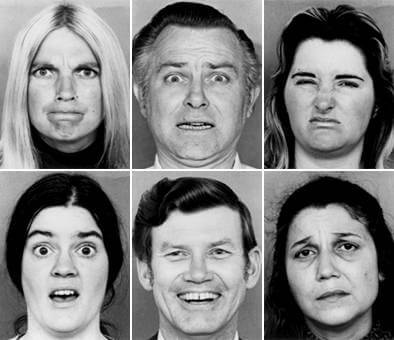 The basic idea, according to Azim F. Shariff of the University of Oregon, is that the specific facial expressions associated with each particular emotion evolved for some reason. Shariff cowrote the paper with Jessica L. Tracy of the University of British Columbia. So fear helps respond to threat, and the squinched-up nose and mouth of disgust make it harder for you to inhale anything poisonous drifting on the breeze. The outthrust chest of pride increases both testosterone production and lung capacity so you’re ready to take on anyone. Then, as social living became more important to the evolutionary success of certain species—most notably humans—the expressions evolved to serve a social role as well; so a happy face, for example, communicates a lack of threat and an ashamed face communicates your desire to appease. The research is based in part on work from the last several decades showing that some emotional expressions are universal—even in remote areas with no exposure to Western media, people know what a scared face and a sad face look like, Shariff says. This type of evidence makes it unlikely that expressions were social constructs, invented in Western Europe, which then spread to the rest of the world. And it’s not just across cultures, but across species. “We seem to share a number of similar expressions, including pride, with chimpanzees and other apes,” Shariff says. This suggests that the expressions appeared first in a common ancestor. The theory that emotional facial expressions evolved as a physiological part of the response to a particular situation has been somewhat controversial in psychology; another article in the same issue of Current Directions in Psychological Science argues that the evidence on how emotions evolved is not conclusive. Shariff and Tracy agree that more research is needed to support some of their claims, but that, “A lot of what we’re proposing here would not be all that controversial to other biologists,” Shariff says. “The specific concepts of ‘exaptation’ and ‘ritualization’ that we discuss are quite common when discussing the evolution of non-human animals.” For example, some male birds bring a tiny morsel of food to a female bird as part of an elaborate courtship display. In that case, something that might once have been biologically relevant—sharing food with another bird—has evolved over time into a signal of his excellence as a potential mate. In the same way, Shariff says, facial expressions that started as part of the body’s response to a situation may have evolved into a social signal.